A woman facing a painful death said she wants the law changed to give the terminally ill assistance to die. Kay Smith, 54, has a lethal mix of untreatable conditions which means she can expect to die from sepsis. She said she does not want her family to watch her suffering as she dies. She is supporting a campaign being launched on Tuesday which is calling for legislation to allow patients to make an informed decision over when they die. The pressure group behind the campaign, Dignity in Dying, defines assisted dying as allowing a terminally ill person to have a choice over the manner and timing of their imminent death. In contrast to euthanasia and assisted suicide, assisted dying would only apply to terminally ill people. Similar attempts to change the law have previously failed to get through the Scottish Parliament - and opponents have argued that the risks are too high. Dignity in Dying said patients should be allowed a prescription which could end their life, and be allowed assistance to take it if necessary, without the risk of any prosecution. It said a poll it commissioned suggested almost 90% of Scots believed dying people should not be forced to suffer at the end of their lives. Ms Smith, a former palliative care nurse who is now a palliative patient herself, has Lupus - Systemic lupus erythematosus (SLE) - as well as a condition that makes her severely allergic to pain medication and antibiotics. She knows that she is likely to contract an infection and die of sepsis that could not be treated because of her fatal reaction to medication. At the campaign launch on Tuesday, she will urge Holyrood to introduce safe and compassionate laws to allow terminally ill, mentally competent adults the choice of an assisted death. Speaking to BBC Scotland ahead of the launch, she said she respects that assisted dying was "not everybody's choice", and that "some people will allow nature to take its course". 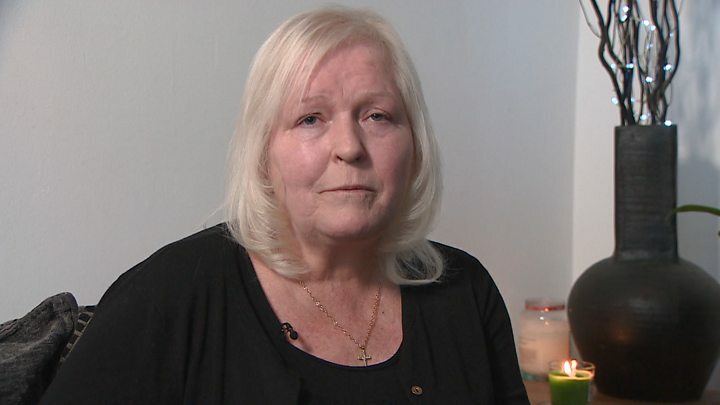 Ms Smith, of Kilwinning, Ayrshire, said: "I could have the choice to have an assisted death and be surrounded by love and go before it got too bad. "Instead of my body rotting away from my extremities up, and my children and husband having to watch that... sepsis is not a nice death." Without a change in the law, she says she could face up to 10 "extremely awful" days at the end of her life, during which she would endure great pain. She wants to avoid these last days of pain by choosing to end her life just before this. What is assisted dying? How is it different from euthanasia or assisted suicide? Because of her health conditions, doctors may be able to sedate her but would not be able to offer painkillers. She fears the experience of watching their mother die in such circumstances would traumatise her children. "I don't want to leave that legacy. The last thing I want to do is leave them with a permanent horrible memory of my death", she said. It is estimated one person every eight days travels from the UK to the Swiss clinic Dignitas to end their life. But many people seeking an assisted death cannot afford the £10,000-trip, and some are too ill to make the journey. Ally Thomson, Scottish director of Dignity in Death, said clinics abroad were not the answer: "Dignitas absolutely outsources this problem, really - the current law is broken when people need to go to Switzerland to have a safe and dignified death. "Most families want their loved ones to stay around for as long as possible - it's the person themselves who doesn't wish to have a bad death and doesn't want to leave things until the last minute and suffer that pain that can happen at the end of life." Attempts to change the law on this issue were made by the late MSP Margo McDonald. The idea was put before Holyrood twice, but her bills failed to receive parliamentary backing. One concern was that vulnerable people could be pressured by relatives, or even clinicians, to take an irrevocable decision. Ms Thomson said: "We know from international examples... that that simply isn't the case. "Once our decision-makers look at the evidence, we think they'll be very satisfied on that point." However, Gordon Macdonald, the chief executive of the Care Not Killing umbrella group which is opposed to assisted suicide, said the last vote on the issue had seen a bill from Green MSP Patrick Harvie defeated by 82 votes to 36. "Most members realised then that the risks of legalising assisted suicide were too high and would put vulnerable people at risk of harm," he said. He more money should instead be made available for palliative care. What's the difference between assisted suicide and euthanasia?